A driver of a stolen car who led CHP officers on an hourslong pursuit through multiple Southern California counties on Monday afternoon appeared to have ditched the car in Riverside County, Sky5 video showed. 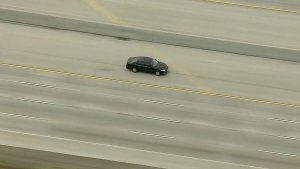 Police said they initiated the chase about 11:55 a.m. near the 91 Freeway in Anaheim after the license plates on the black Toyota Camry came back as stolen, officials said. The suspect headed west through Anaheim and reached speeds of more than 100 mph. The California Highway Patrol took over the chase about 12:20 p.m.
By 12:45 p.m. the driver was in Colton and continued along the northbound 215 Freeway in San Bernardino. At one point the driver, a male, appeared to make signs at authorities and was throwing items from the car, aerial video from Sky5 showed. The driver eventually transitioned onto the 15 Freeway near the Cajon Pass. The driver got off the highway and back on the southbound side of the 15 Freeway and continued leading authorities on the pursuit, which at times reached high speeds. He transitioned onto the eastbound 10 Freeway in Rancho Cucamonga about 1:15 p.m. The driver weaved in and out of traffic, aerial video showed. “He’s all over the place, he’s driving a little erratic, so it’s really dangerous for our officers out there to put down a spike strip,” CHP Officer Ramon Durant said. “So that’s one thing we want to make sure for our officers, is that they’re safe out there as well. We don’t know the mentality, the state of mind of this driver is right now,” Durant added. About 1:30 p.m. a CHP officer tried a PIT maneuver on the driver oncee he got off the 215 Freeway in the Riverside area, but he was able to get away, aerial video showed. He eventually pulled over and parked in a residential area in Riverside, but eventually continued eluding authorities, aerial video showed. Authorities appeared to pull away from the driver on the ground, but were still following him in the air. The driver eventually got back on the westbound 60 before quickly getting back off, aerial video showed. He continued driving on the wrong side of the road on a surface street in Mira Loma, aerial video showed. He continued on surface streets in Jurupa Valley.